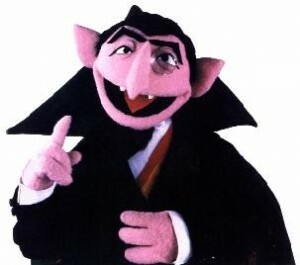 Well, okay – I don’t mean people who actually count – like Count Von Count. I mean people who matter. I mean people who are meaningful. I mean people who benefit you. That doesn’t mean people you can take advantage of, or use. I mean people with whom a valuable relationship can be formed. Reaching people who count isn’t limited to customers, or prospects. Sometimes it’s reaching people who can mentor us, coach us or help us grow. Sometimes it’s people who can serve as collaborators. There are many valuable relationships we can create and foster. Analytics existed before computers. Businessmen created databases – once they were simply card files – of inventory and customers. Handwritten charts and logs kept track of all sorts of things. Primary among those things were client lists. Business owners wanted to have good records of their customers. We needed their contact information, including their mailing addresses. Our direct marketing campaigns depended on the accuracy of our analysis – our analytics. Computers enhanced our ability to effectively track many more things. We could dissect the behavior of our customers. Whatever we captured in our computers could be easily outputted to give us greater details. If we captured a customer’s eye color, then we could easily find out which customers had blue eyes. We went from low information diets to feeding at an all-you-eat-buffet where we could feast constantly! The gorging began…and continues. More data than we can possibly digest. It’s the stuff of business intelligence, business analytics. Even so, we get caught up with how many people are on our list – how many we’re converting into buying customers – how long they linger on our sales pages – and so much more. The numbers. It’s all about the numbers. I’m not saying numbers aren’t important. Nor am I saying that you shouldn’t study or analyze all the data available to you. But you must remember that behind every single number is a PERSON. A real, live breathing person with a family, people they love, people who love them and all the other stuff that life brings to the party. Build a list, say the Internet marketers. Build a BIG list. If you can get 10,000 people on your list – well, that’s great. But 20,000 is better. And if you can surpass the 50K mark, you’re in the rarefied realm of guru status! Just think of it. If you only convert 2% of them into buyers, then you’ve got 1000 buyers! That’s 1000 people paying you. No wonder a 50K list of names and email addresses puts you among the most select folks selling stuff online! We’re all gonna be filthy, stinking RICH. Building a list of any sort is more difficult than you might think though. Let’s say you could care less who these people are – how are you going to reach them? How will people even know YOU exist? Will you spend money on PPC (pay per click)? Will you hired an SEO (search engine optimization) expert who can get you ranked number 1 in Google? Will you join up with somebody else who has a big list? Who are these people that matter? Who counts? That depends on your business. We all need people who are interested in what we’re selling. Those are the people who count. If I’m selling scuba gear then a list of 10,000 people who are into bird-watching won’t do me much good. Unless, of course, they’re scuba divers who also happen to watch birds. But there’s no direct connection between those two. It’s highly unlikely that bird watchers are scuba divers. Now, if they were surfers instead – maybe! No, if I’m selling scuba gear then I’m in search of people who love to go diving. More importantly, I’m really interested in people who regularly scuba dive or who will spend money toward scuba diving. I’m not interested in a list of 10,000 names of people who go on vacation and rent scuba gear. I’m looking for 10,000 names of people who actually purchase scuba gear. Once I know who counts – then my job is to find them. Reaching the people who count is often an overlooked strategy. People wrongly assume that anybody who opts into their list must be a hot prospect – somebody with a high inclination toward purchasing something they offer, like scuba gear. That’s only true if you have properly targeted – that is, if you’ve taken aim at finding only the people who count – those who are definitely interested in what you offer. The other component involved in this is clarifying your offer. I don’t mean making your offer clear to others. I mean making your offer clear in your mind. Can you narrow your focus so your offer is precise? Again, people fail too frequently because they haven’t clearly defined what it is they’re selling. If it’s unclear in your mind, it’s super unclear in the mind of your prospect. Consider the competitive field of web design. Let’s say you open up a web design shop and you think everybody is your market. Anybody who wants a website is your prospect, right? So you don’t put any restriction on building your list. You’re not trying to reach any specific type of person – all people are people who count…because your business has a universal appeal. It’s a common mistake. Some businesses die having never reached the people who count because they never calculated what they were offering – so they could figure out who counted. The most successful web designers I know are so specialized it’s ridiculous. I know web designers who not only specialize in WordPress sites, but they specialize in customizing specific WordPress themes. It’s the only thing they do. That specialization allows them to more narrowly focus on WHO – on who it is that really counts for them, and their business. The same thing will work for your business. Narrow your focus. Drill down to the real core of your offer. That will prepare you to drill down to the people who count most. Now, get busy reaching only the people who count. Warning: It’s more difficult than you think, but it’s easier when you know who you are trying to reach.